"These unknown shrubs on the website (...) are both the same species. 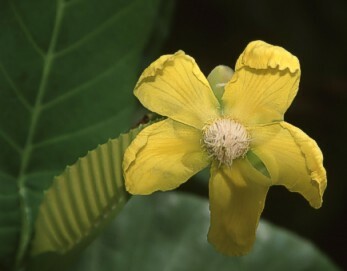 It's a Dillenia alata, which is native to eastern Arnhem land and introduced to the Wildlife Park. The top pic is in flower and the bottom one is in seed. 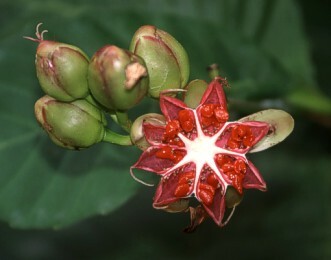 It features in the Plants of the Top End book by Brock if you're after any info on it." "Just one thing the image of Red Beech taken at the Territory Wildlife park is of Dillenia suffruticosa not Dillenia alata as stated. Its an introduced species form Asia not a local NT thing. As for Dillenia I think that the ones you have (...) are alata. Its real easy to tell in flower. The only real contender is D. suffruticosa. You can sort of tell by the leaves but its a bit tricky to explain. D. suff often have larger leaves and also have distinct ribbing or venation. When the young leaves emerge they often are prominently ribbed. When flowering and fruiting they are very easy to tell apart. My observation also would be that D. suffruticosa often forms a thick bushy mass with multiple stems that need pruning back. D. alata is more of an upright tree. Dillenia alata leaves leaves10-22 cm X 8-12 cm, seeds (aril white), stamens red at base. Dillenia suffruticosa leaves 15-30 X 10-17 cm, 12-20-nerved, rounded or blunt at apex,seeds (aril red), stamens yellow/white."